The gut microbiota has undergone radical changes. 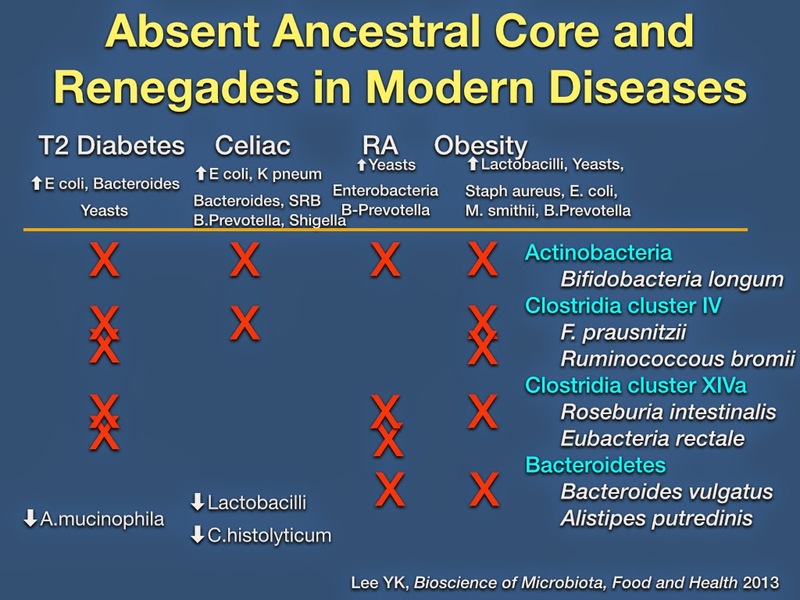 Human gut anatomy are unaltered but the microbial ecosystems have degraded. Health may mirror these changes and how we acquire our microbiota including the ways we procure our food -- shifting at the neolithic from tedious hand foraging to village crops to (now) massive, post-industrial farming operations and livestock production. Our distance from the dirt is immeasurable. New technology allows characterization of the ancestral gut. Comparatively, species in ancestral and non-industrialized guts are robust in diversity and less fragile in balance. Ways to resolve this 'gut identity' crisis involve re-wilding and revisiting the ancestral, soil-connected gut. Good job Grace, it's hard to fit everything into 30 minutes but you did well. I've been reading your blog for a while and I picked up a few new things. Have you considered podcasting/video? It requires less time on your part and I sure do enjoy the method of delivery, I find it easier to understand personally. The 5 Mass Extinctions idea is brilliant, hope you expand and blog on it later! You did a great job explaining the gut biome in your short presentation. Thanks for posting it here for us to see. Hope to see lots more discussion on this topic. Now, to figure out this Twitter thing! I concur with your mini-extinctions. We humans are too brilliant and we are brilliant-izing ourselves into slow, painful extinction. I think extinctions are quite normal and natural, and truly humans are just a half a blink on the evolutionary time scale.... We are nothing really. H. erectus and Neanderthals were nothing too yet they also brought mass extinctions of certain species of mega- and minor fauna apparently. Our reach is far more spectacular in shifting not just animals but also the microbiome of vast oceans, land/soil and humans. Paul Jaminet's talk was fantastic at AHS14. Have you watched? He discussed how domesticated animals had parallel obesity trends which is naturally related to gut dysbiosis and 'extinctions' there. Chris, Do you think this media fits me? I'd love to do Google+ hangout and get your questions live. Would that sound good? What time window does that work for people both east/central/west coast? Thanks for your curiosity and cool thoughts! I like that!! Thx!! I've heard of YouTube live. Is that similar to google+ hangout? You must be an east coaster!! I'm not sure of the differences honestly. I'm in Colorado! The YouTube idea is just because people could access the info anytime. You can always record a live hangout session, then post to Youtube, whatever you'd like to do really. maybe a dumb question but could "lactose intolerance" be mostly solved with the right gut bacteria? also will this be an exploding field of medicine now? - adding different strains of bacteria to your digestion because i dont think most people want to eat dirt or have an FMT and antibiotics will still be necessary from time to time. I love the picture of you with Paul outside at the event. Both of ya's are xtreme adorbs. Wow, that left me wanting more. Nice job. Can you give a few recommendations of probiotics you also like besides the three main ones you recommend? Secondly, out of curiosity, what is your typical macro nutrient ratio? I believe I saw somewhere in the comments before that you eat 60 or 70% carbs, but I am not sure. great talk...loved the historical overlay between the gut biome and evolution. on a different note...any thoughts on an overgrowth of strep that consistently shows up in various stool cultures (genova, ubiome, American gut)? trying to address ongoing IBS symptoms of diarrhea and gas. would there be a way to target this without knocking out the good guys? You did a great job of finally putting carbohydrate intake via starchy tubers into a solid evolutionary argument. I know it's been done before, but yours was seamless. One of my best gal pals is in Boulder. You're not far. We just moved back to Bay Area one month ago. Awesome. I may try both mediums! What questions do u have. Seriously throw them down for me! Happy gut symbionts usually have lactase if slow, low amounts of fermented dairy is intro'd into circulation. Studies from Yakult back this up. Reg, Have you checked Paul's AHS talk? EPIC. It's so good. He goes over his three most profound observations which are contrary and ironic to some common ideas. He's one of my favorite homeys. Was do great to hang with him! Grace I think we all have a lot of questions for you. Here's my suggestion. Post a blog post stating that you will be doing a Q&A session on X day. Ask people submit their questions in the comments section. Take it further by asking Richard at FTA to promote the Q&A and maybe do it with him. That would be awesome. I'm sure so many more questions will come up after the Q&A which mean progress! One question I have is what's the difference between SIBO and SIFO and what are the symptoms of each, is there a way to diagnose without expensive tests? Also, what is an ideal or recommended regimen for taking a bunch of probiotics in pill form? I'm experiencing marginal results with just one or two probiotic pills. Dr. BG/Tatertot - I loved your presentation and started watching the others today. I was blown away by Denise Minger's very non-professional (not unprofessional!) talk about high carb diets. I couldn't believe she actually talked about Tatertot's Potato Diet and even mentioned RS. I have been having SIBO-like symptoms for my entire adult life, the only time I would find relief was on a 100% potato diet a la Tatertot from Mark's Daily Apple Forum. When I would stop, within days the gastro distress returned. Much to my delight, I followed Dr. BGs 7 steps and I now have my gut under control for the most part. I was having some issues after a summer of BBQ splurges and did a week of all-potato diet which quieted my gut down, I then transitioned to lots of fermented foods and doubled-down on the probiotics I was taking...it worked! I think you'd get some mileage by using the potato diet as an intro/cleanse to the 7 steps. I'm telling everyone about it! Those are wonderful ideas and I'll implement! This is actually a super fun medium me and I like the real time aspect actually. It's responsive and interactive so I'm glad you suggested your thoughts. LOL Grace those are some great names! I personally like "The Scoop on Your Poop" but it doesn't matter what I think, but I think that name has some intrigue. A podcast/videocast would be awesome. When are you going to make it happen!? Do you know how to start one? I can offer limited help or barter in exchange for your services. CONTACT ME CHRIS. I think I might do both actually lol. thx~! I see you ask for questions. Mine is about how to treat my mild lupus/connective tissue disease, which started in October 2013, after a UTI in August, treated with Trimethoprim. Main symptoms were rheumatic pains in wrists, shoulders and fingers. These increased over time and I finally sought medical help end December 2013 when it became clear that the pains wouldn't go away. This led to a diagnosis of Undifferentiated Connective Tissue Disease in February 2014. Being a great fan of Paul Jaminet, I know that his take on lupus (and a lot of other autoimmune diseases) is that it is most likely caused by some pathogen. Accordingly, I resisted conventional treatment with the immunosuppressant mycophenolate mofetil as recommended by my rheumatologist and instead tried antibiotic treatment, according to the Thomas McPherson Brown protocol, in April 2014. I also take low-dose naltrexone, Prescript Assist, AOR Probiotic 3, potato starch and a paleo, dairy-free diet. Unfortunately, I saw no improvement, rather the opposite: I lost all energy and a lot of weight (from 71kg to 54kg over 6-month period from December 2013) and my arthritis symptoms spread to my feet, ankles, knees and hips, the previous pains in shoulders, wrists and hands got worse and worse. I needed 'full allowance' of paracetamol and celebrex to be able to bear it. My GP got so worried by the weight loss that he ordered a CT scan in July 2014, which showed lung inflammation and enlarged lymph nodes on both sides of my diaphragm. He then ordered a biopsy of the largest lymph node to test for lymphoma (my mother had non-Hodgkins lymphoma at age 65, my brother had Burkitt's lymphoma at age 51 two years ago) and started me straightaway on steroids, mostly because of the lung inflammation: 40 mg of Prednisolone for 4 weeks, then reducing by 10 mg every 2 weeks until maintenance dose of 10 mg. Thankfully, the biopsy results were negative, no cancer was found. The steriods were the only treatment that has offered me any relief. With each reduction the symptoms came back a little more, and the cut from 20 to 10 mg caused the greatest change in symptoms. On my GP's advice I have increased the dose to 15mg, and hope to cut down again more gradually, maybe by 2.5 mg at a time. He now urges me to start mycophenelate, as a "steriod-sparing" measure. For further background information, I am 55 years old, peri-menopausal, was diagnosed with Type 1 Diabetes in February 1990 and with Coeliac disease 6 months later in August 1990. Since then, I have conscientiously followed a gluten-free diet, although not grain-free. Since October 2012 I followed a Primal diet à la Mark Sissons including cream, butter and hard cheese, in October 2013 I discovered Dr Bernstein's ketogenic diet, which I followed until December 2013. Then I found Paul and Shou-Ching Jaminet's Perfect Health Diet blog and learned about the necessity of safe starches to avoid thyroid and autoimmune problems; rather too late, I fear, as I developed the UCTD, and suspect that I have thyroid problems, too, as I never got the energy buzz one is supposed to get on a ketogenic diet. The latest annual standard thyroid blood run by the diabetic clinic I attend on 10 January 2014 show TSH = 2.53, T4 = 13, both within normal range, I was told. My diabetic control was never great, HbA1C between 7.5 and 8.5 over the years, although it dropped to 6 while following Dr Bernstein. Since changing to the Perfect Health Diet, is went up to 7. I would love to hear your views on my health issues and would appreciate any advice you may offer. Your gut problems started whenever you started mercury based vaccines and antibiotics (or if your mom had these). These triggered the gut problems which lead to T1 diabetes and celiac ~24 years ago IMHO. Then you mentioned "instead tried antibiotic treatment, according to the Thomas McPherson Brown protocol"... If you watched the AHS14 talk, then you might start to piece together how this is more likely to have worsened health as poor health is a direct reflection of a poor, suboptimal gut. What do you think of the 7 steps? Are you volunteering or near farms? Do you garden? How is your intake of fermented foods and beverages? Thank you for your swift reply and helpful comments. I started the antobiotics as per the Thomas McPherson Brown protocol because that is what the Jaminets recommend for eradicating the pathogens causing the lupus. But now I understand that you don't agree. You refer to natural remedies for parasites in your blogs, what are they called? Do you think that I could benefit from them? I have tried making ferments at home, but without success, they have always gone "off" (much to my husband's distaste); will read Tatertot's guest post on this again and have another go. I have ordered kefir grains and a kombucha starter kit which should arrive today :). I have also been eating live yoghurt. I have read that NSAIDs stop the gut from healing by keeping the tight junctions open, but I cannot find anything about whether steroids and other immuno-suppressant drug also have this effect. Do you know? I am currently in such poor physical condition that I hardly make it out of the house; I am so tired all the time, and any exertion leaves me breathless and with stabbing pains in my lungs. So I don't garden nor volunteer on farms, although I will keep this in mind for when I feel better. I am so tempted to start taking the mycophenolate, as I feel so poorly at the moment and the steroids offered much welcome relief, is it posiible to heal the gut at the same time as taking these drugs? I once ate 'off' fermented kraut (I didn't make it -- but stupid me saw the fluffy filamentous fungi) and had SIBO again for over one month! Are you taking immunosuppressants and steroids? Unfortunately if the white count is low, then consider that the safest probiotics are the bifido ones until your immunity improves. Bifido love oligos (like in breastmilk -- Paul is right on about breastmilk) and inulin. For pain and inflammation there are a gazillion options utilizing botanical options. Biocurcumin is one of my favorites. iherb has Zyflamend and Dflame. Awesome stuff. sorry to hear about your month of SIBO after eating off kraut; good job you knew what to do about it. My husband just doesn't like the idea (and smell!) of home-made ferments, but I will persist. My kombucha starter kit and kefir grains have arrived and are brewing away, as well as another batch of sauerkraut. Thanks for the pointer about bifido, oligos and inulin - I love onions, leeks etc. Also thank you for the names of botanical anti-inflammatories, I already take biocurcumin, I will investigate the others. I will also stop the Mynocin that I have been taking for the lupus. Thank you again for your insights and help and sharing your knowledge on this great blog! Kombucha Mamma, Hannah, has great tips for people. Ck out her website. Would love to hear how your kefir and kombucha turn out! With pharmaceuticals like NSAIDs (ibu, etc) and steroids, the immune system is shut off. (Stress does the same thing) Long term this is not productive or fixes the root problem, and worse, they harm the gut, the core of our immunity. 70-80% of immunity lies in the long and vast small intestines. Working to identify and work on the root cause yields far more improvements and health reversals. That's what I was wondering, do immuno-suppressants and steroids harm the gut the same way that NSAIDs do, thank you for your answer to that. Of course you are right that it much better to fight the cause than the symptoms, I will take that to heart. The first fermentation of my kefir was finished this morning, it is now bottled and in the fridge for its second fermentation. I had a taste of the liquid and it was very pleasant, so I guess everything is going as it should. Also had a look at Kombucha Mamma Hannah's website and watched some of her videos, will no doubt be referring to them more in the future. May I ask you something else? What in your opinion is the effect of a colonoscopy on the microbiome? This is what is proposed next for me in the investigations of my unexplained - but by now, resolved - weight loss. Thank you again for sharing your knowledge so generously. Where do I get the termite like probiotic. Burkino Faso termites contain Bacteroides and Rx Assist contain this grouping as well (not exactly the same species). In the video you mentioned that Prausnitzii and Roseburia had so far no been included in probiotic supplements.